Late last week, the final headliner was announced for Glastonbury 2017. So, (spoiler alert!) the official headliners are Radiohead, Foo Fighters and Ed Sheeran at Worthy Farm this year. Last year offered perfect weather for a top notch pair of wellingtons, especially with many people suffering from what has been dubbed 'Glastonbury Ankle' from ill-fitting boots tackling record amounts of mud. Sculptures were even made of abandoned wellington boots that didn't make the grade! So, what better way to get into the Glasto spirit, than to wear the brand favoured by the organiser himself - Le Chameau? If you're feeling flush this spring, we do stock the actual style Mr Eavis apparently favours, called 'Chausser' at £340. However if you are looking for a bargain for your festival fun this summer, The Country Catalogue is currently running a Le Chameau Sale! With an excellent hard wearing Vibram sole, the Le Chameau Country Vibram Wellington also features a breathable cotton lining, light to wear suitable for all weathers. The outstanding Vibram® double density rubber sole offers excellent all-terrain grip and is very resistant to wear. 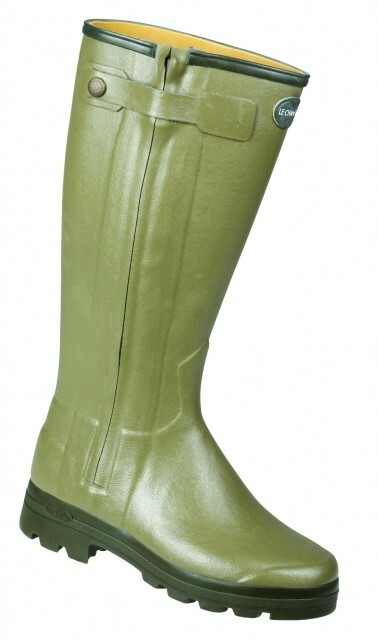 Available in signature olive green and finished with a stitched leather effect edging at the top of the boot. Just the ticket for what seems like six different types of mud you get at festivals! Who hasn't been caught in 'sticky sludgy' or lost their balance on 'slippy slidy'? Or perhaps the Giverny in Blue, a stylish and supportive walking boots with a two-coloured rubber upper leg trim. Made of natural rubber and a jersey lining, that flexes to follow the foot exactly, the Giverny is comfortable yet durable. So maybe now is the ideal time to retire the Hunters and follow the big man?